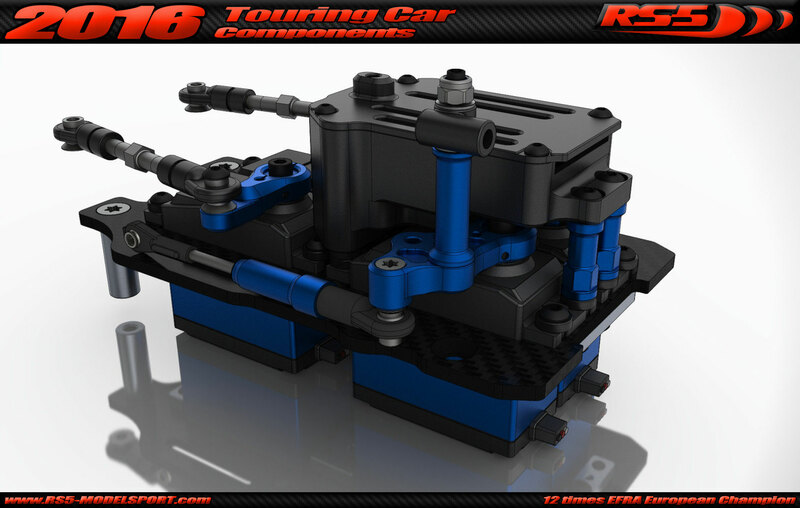 For several years we have been thinking about an All-in-one RC unit, where all RC component (included servos, receiver, cables…) connected together and You can easily assemble it in or out. The advantage of this system is that you can install all RC components on the servo tray outside of the car, so it is more simple and a way easier to work with them. Also an advantage, if you have a spare RC unit then you can swap them very easy and fast in case of failure. To make this All-in-one RC unit we had to slightly modify our current servo tray design to allow the perfect routing of wires. We alse designed a special Receiver box that sits over the servos. 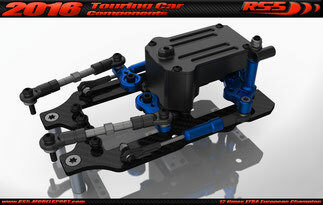 This new All-in-one RC Unit compatible only with 4pcs. servo setup (2pcs. steering servo) and not compatible with 3pcs. servo setup (single steering servo). The rear design of the carbon fiber servo tray had to be changed to let the servo wires go through up to the receiver box. So we made the back of the servo tray a bit longer at the side and a bit shorter at the middle. This design change protects wires against the pressure of the fuel tank. The ordering code of the updated servo tray are the same as the elder one, because from now on we deliver all servo trays with the new design. We offer the All-in-one RC unit Upgrade kit for the T14 and the T15 cars. Only top decks ares different between T14 and T15 versions. Kit includes the servo tray with alloy mount plates, servo bushings, Receiver box, top decks and all mounting screws.You must fill out and send to us the servo configuration sheet prior ordering. This shows us which components specification you need for your servos. 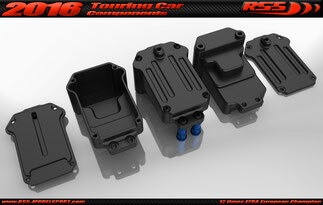 Our new Receiver Box is made of CNC machined high quality plastic. 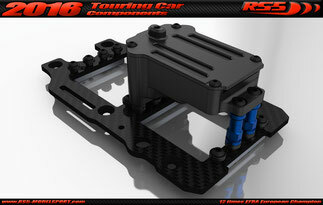 It is mounted on the top of the throttle/brake servos and has the same mounting points as the servos. The top part of the receiver box has a slot where the antenna wire can fit to protect it. The receiver box is compatible with normal size receivers like the Futaba 614, 304 and Sanwa 471 and 472 and all similar sized receivers. The receiver box is not compatible with bigger receivers like Futaba 603. We offer the All-in-one RC unit kit to build a spare one. 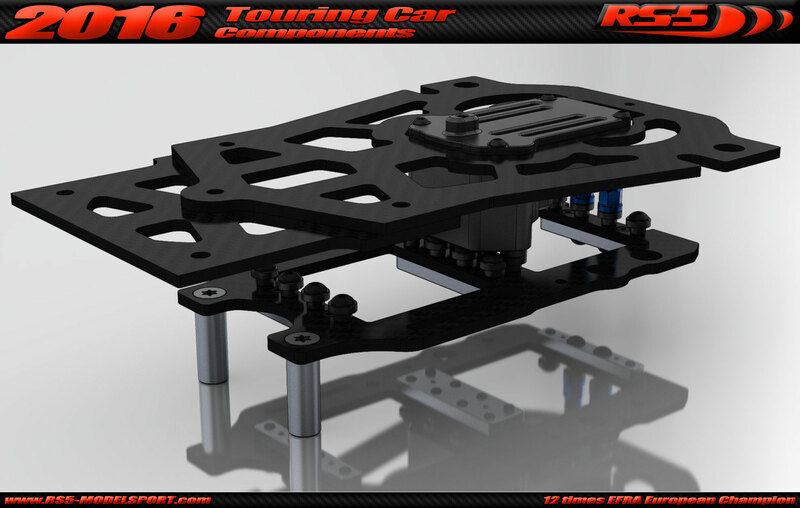 The kit includes the servo tray with alloy mount plates, servo bushings, servo arms, throttle compensators, steering linkages, Receiver box and all mounting screws necessary to build your spare All-in-one RC unit. This kit is compatible with T14, T15, T16 and Tx16 cars.You must fill out and send to us the servo configuration sheet prior ordering. This shows us which components specification you need for your servos. A redesign of our front and middle top decks was necessary, because of the new receiver box lolls over the top deck plane. 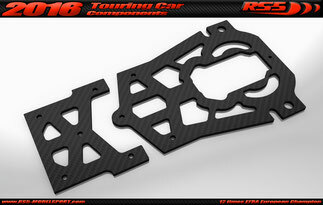 We created this new top decks for the T14 and for the T15(same as the T16, Tx16) car.